To add a cell number for texting messages please follow the steps below. This MUST be done for the number to be activated for use through OnDeck. Ideally an account holder will perform the below steps, as it requires retrieving a verification code from their cell phone and entering it on the site. Chameleon users: In the side menu click My Account > My Account. New CMS users: In the side menu click My Account > Account Info. To add an SMS number for one of the athletes in the account, click the Members tab and then click their name; otherwise stay on the current screen. Enter an SMS cell number and select its Carrier. Click Save in the upper right and it will send that number a verification text. Check your cell phone for a "Verify your SMS" text from notifications+alias, where alias is your team's alias, and open it. Note that some cell carriers can take awhile to deliver the message. Tap the link and you should see one of three possible messages. "Success! We have validated your primary SMS." (or "secondary SMS" if that's what you were verifying) The SMS number is verified and ready to receive texts from the team. You may skip the rest of the steps. "Sorry, your primary SMS has already been validated." Sometimes just opening the text will verify the number, resulting in this message. The SMS number is verified and ready to receive texts from the team. You may skip the rest of the steps. "Sorry, the code XXXX did not match any codes." Continue to the next step. If tapping the link doesn't work, note the four digit code number in the text message. Back in your team's SwimOffice website, click the Unverified button above the SMS number. If you got the error in step 7c on your mobile device, click Resend Verification and go back to step 6. 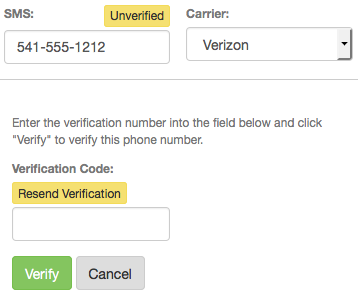 Enter the four digit code from your text message in the Verification Code field and click Verify. You will see Verified in green above the SMS number. You may need to refresh the screen to see this. If you are an admin and want to assist with the process, you will need to be in direct contact with the person wanting to verify their number while you do these steps, either in person or over the phone. Chameleon users: In the side menu click Team Admin > Account/Member Admin > Members tab. New CMS users: In the side menu click Team Tools > Members. 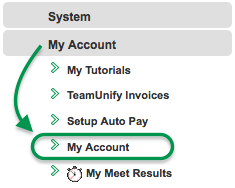 To add an SMS number for an athlete click the Members tab, otherwise stay on the current Accounts tab. Search for and click the name for whom you would like to add a cell number. Fill in the cell number in the SMS field. Pick the cell Carrier for that phone from the drop down menu. Have the owner of that SMS number check their mobile device for a "Verify your SMS" text from notifications+alias, where alias is your team's alias, and open it. Note that some cell carriers can take awhile to deliver the message. When they tap the link they should see one of three possible messages. If tapping the link doesn't work, have them tell you the four digit code number in the text message. 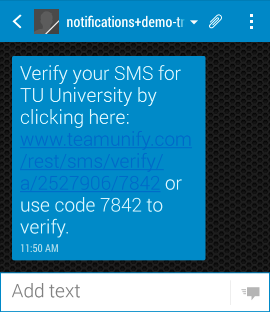 Click the Unverified button above the SMS number. If they got the error in step 8c on your mobile device, click Resend Verification and go back to step 7. 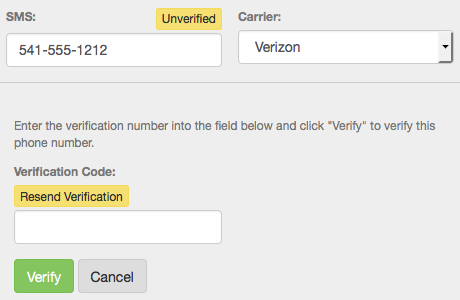 Enter the four digit code from their text message in the Verification Code field and click Verify. You will see Verified in green above the SMS number. You may need to close their profile and reopen it to see this. Can an admin verify or confirm an email address or SMS number?